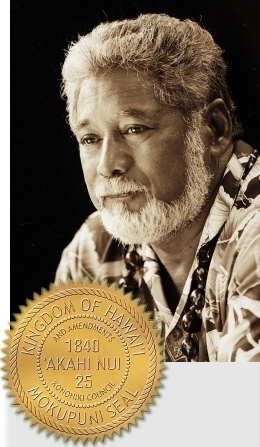 That the Kingdom of Hawai'i, Moku'aupuni (Nation) was NEVER invalidated and has never been dissolved, and shall from now henceforth stand strong as the only True and Just ruling Government of the Kingdom and Islands of Hawai'i. Therefore the Constitution of 1840, and the Declaration of Rights of 1839 have never been suspended, and are still in full force. The Overthrow of 1893 was never valid and never shall be, and although this wrong has been thoroughly outlined and admitted by the current President and both houses of the Senate of the United States in a sworn confession known as Public Law 103-150, and was signed by the President into Law, they have done nothing to correct this wrong which was perpetuated upon me and my people by their own agents. There are continuous and on-going acts of treason, fraud and conspiracy occurring in Hawai'i against me and my people. Now is the time to undo the wrong. I Am here to undo the wrong. In restoring this sacred Monarchy, I now Claim My Palace and My Judicial Court, that known as Iolani Palace and the Monarchy Court, a Court of Common Law, sworn and created to uphold the Rights and Justice of and for the People. 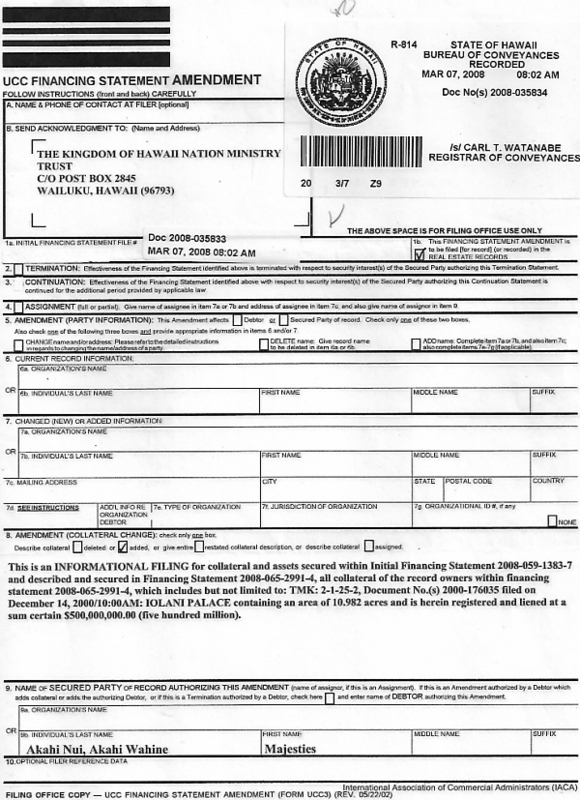 I also claim all artifacts belonging to the Kingdom of Hawai'i, including all items in possession of the Bishop Estate and all sacred Heiaus and burial sites of our ancestors. This also includes ALL of the Kings Trail on all islands and every aspect thereof. 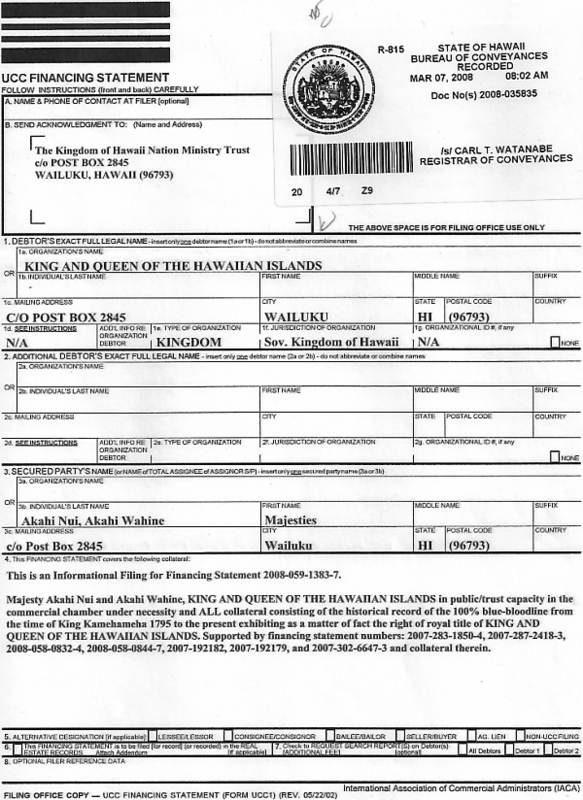 Any and all of those persons, groups or organizations who have used or are still using the Kingdom of Hawai'i name, now let it be known that they are not the True Kingdom. They now no longer have any valid right to use that name from henceforth, as I Now Re-Claim the Name and Re-Store the Crown and Throne from those thieves who have wrongly taken and abused it without My Consent. This is the True Kingdom which now cometh, the True Kingdom of God. I and the True Kingdom have never come out before this. Now we come out and present ourselves, as it is Our Time to Arise and Claim Our Sacred Seat of Power. It is now God's Time to Move upon the Earth. If anyone wishes to challenge me in this Re-Clamation, you have 25 days to answer and challenge this Claim. After this time, let this matter now forever be resolved. So Be It. The Kingdom of Hawai'i rests upon the shoulders of Akahi Nui. The Anuenue signifies "Umi-a-Liloa" the son of Liloa (k) and Akahi-a-kuleana (w) 25 in hawaiian numerology equals 7 signifies "The Eyes of the Akua" The island in the background is the vision of "The new birth of an island" The two kahili's signifies "100% Royalty of Blue Blood Lineage" The island with the nine kalo leaves signifies "Life to the Islands" The Pueo signifies "Akahi Nui's Wisdom" which comes at night The Honu 'ea signifies "The Unity of All the Islands" The yellow ribbon signifies "The Arms and the Shoulders of Akahi Nui" who holds the Kingdom of Hawai'i and the burdens upon his shoulders Black is the Past Red is the Bloodshed Yellow is the light of "The New Beginning"
The Royal Coat of Arms was disigned by High Chief Haalilio. His Royal Majesty holds the Royal Coat of Arms through his lineal descendant of the 6th great grandfather Keoukupuapaikalani and his 6th great grandmother Akahi Nui. The crest within the Royal Coat of Arms was placed upon the Royal flag. The Quarter and the Forth Quarter of the arms display the stripes of the Royal Flag. That is the purpose of the stripes to signify Unity. The number of stripes was set at eight to represent the principal islands of Hawai'i (Hawai'i, Oahu, Molokai, Maui, Lanai, Niihau, Kauai, and Kahoolawe. The spear is symbolic of nation power. 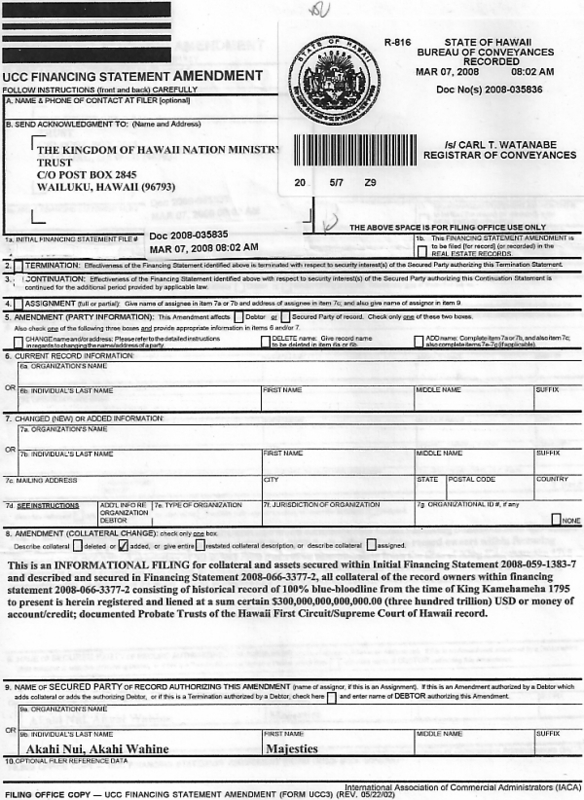 The kahili feather-covered staff indicates royal prerogatives. The Second Quarter and Third Quarter of the arms each show a puloulou the emblem of protection and refuge. 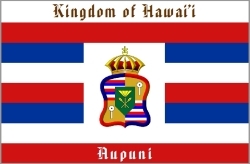 The puela (triangular standard) was also raised by the ancient Hawaiian Chiefs as a kind of flag. This appeared near the palace doors as religious symbols.